Watering should be pretty simple, right? Just train a hose on something like a mushroom log for a few minutes until it looks wet, then go home. Well, that is what I did my first year mushroom farming. Those logs turned out pretty well considering that this little water doesn’t really penetrate into the logs. What you need in the first six months of mycelium growth – what we call “spawn run” – is a weekly or biweekly watering of about an hour of continuous watering. I wised up my second year of operation and invested in a couple of sprinklers. 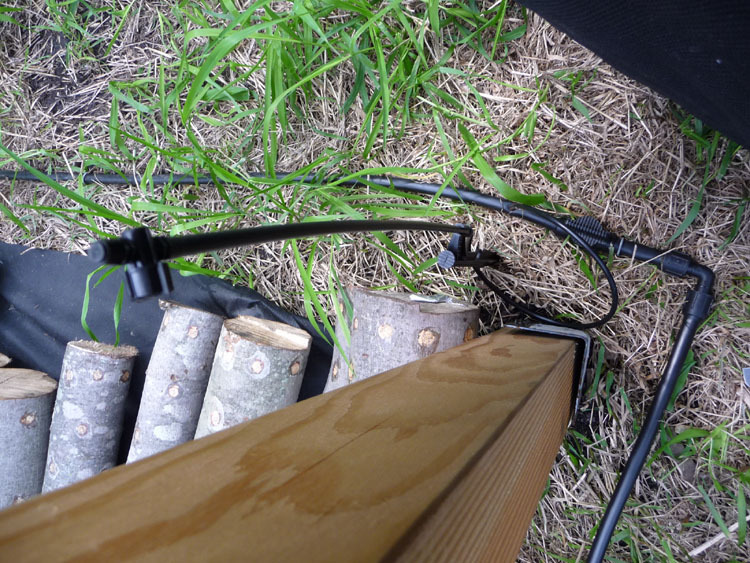 They both fit on the end a 5/8″ water hose and delivered water to between 20 and 40 logs at a time. I balanced the sprinkler up on the log stack and turned the nozzle to start the water flowing. Back then my logs were scattered in a few yards, but all close together, so I would bicycle over to each yard every hour to move the sprinkler. For one yard this lasted most of the day. My third year I bought a fancy new sprinkler on a tripod. The tripod meant I wouldn’t need to balance the sprinkler on logs, and come back to a sprinkler that was spraying right into the ground. This sprinkler also produced finer droplets, which watered in hard-to-reach places better. It was a fine sprinkler, but I still had to move it every hour. This took on a ridiculous cast after I introduced hundreds more mushroom logs and moved them to a central location at Grow! Twin Cities. Yes, last year I would spend a day and a half at a time watering. Fortunately this was largely unnecessary until midsummer, when the rains tapered off. Then I started fantasizing about my next watering system, and I had lots of time to contemplate it. That fall I purchased some micro-sprinklers, tiny sprinklers that work together in tandem so that you can water a larger area, and using less water. I used standard hose, but with lots of complicated and expensive brass fittings recommended to me. I attached these sprinklers to u-posts – green painted metal posts like you might use to hold up rabbit fencing or tomato plants. But the sprinkler setup was expensive enough that I had only enough to water a hundred logs at a time, so I was still moving this around every hour. Also it didn’t look so impressive. Not like my latest set-up, which I put together this spring, and is doing well so far. It is also a micro-sprinkler system, but the fittings are cheap enough that I was able to buy enough to outfit my whole operation. Theoretically that means there will be micro-sprinklers among the woods log stacks as well as in the shade structure, but I haven’t tackled that yet. I only have four or five micro-sprinklers on a line, and each line is controlled by a shut-off valve (see top photo). 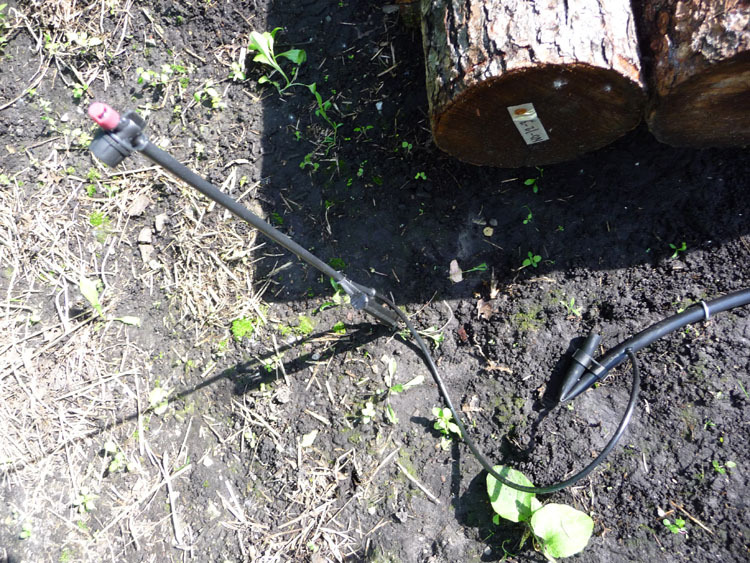 individual micro-sprinkler on riser anchored with ground stake, connected to 1/2 inch poly tubing with 1/4 tubing. 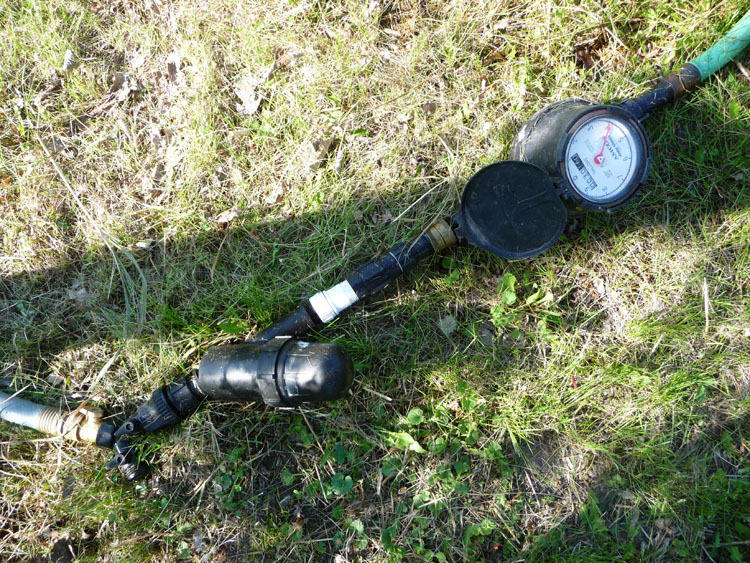 These individual lines lead back to a whole series of components, including a water meter, 30 psi pressure regulator, filter, and backflow regulator. Oh, and there are a couple of adapters and shut-off valves in there for good measure. They all do their thing, but I was most anxious about putting in a pressure regulator, since the woods area is uphill and about 30o feet away, and there will inevitably be a loss of pressure. So far all these fittings have done the trick; the micro-sprinklers work in the shade structure, and I have used my old tripod sprinkler to good effect in the woods laying yard. This is all very good, but what watering system will I use next year?